Brutal Legend Countersuit Describes Guitar Hero As "Competition"
Brutal Legend developers Double Fine claim that Activision is trying to torpedo their game to prevent it from competing with Guitar Hero, according to a countersuit filed last week, the Associated Press reports. The suit also claims that Activision prefers to develop games based on their existing roster of titles, and not develop original titles. "In 2008, Activision and Vivendi met and made a decision to walk away from Tim Schafer, Double Fine and Brutal Legend," Caroline Esmurdoc, COO, Double Fine Productions, told Kotaku in a prepared statement. "Now that we've found a publisher and the game is getting sensational coverage, they want to stop its release. Double Fine's countersuit is a demonstration of our intention to fight for this game - Activision will not kill Brutal Legend." Double Fine's suit also claims that Activision is involved in unlawful business practices, according to the AP story. Double Fine's countersuit contends Activision's lawsuit was filed to hurt the company and the game, and that it was involved in unlawful business practices and a conspiracy to protect "Guitar Hero" sales. Activision's "purpose is not only to cancel 'Brutal Legend,' but to kill it completely so that 'Guitar Hero' would not have to face the competition," the lawsuit claims. 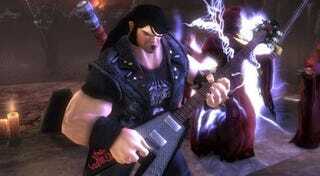 Brutal Legend is scheduled for release this October, but Activision has sued seeking to block the release of the game. A hearing is scheduled for later this month.